← What’s Next For God? The process of becoming somebody and finding our way to genuine community, which I regard as the evolutionary directive of our species, is a hero’s journey fraught with pitfalls and dead ends. If we were driven and determined by a force entirely outside our control, we would have arrived at our apotheosis [see definition 2] long before now. But with the introduction of self-conscious awareness our ultimate success in realizing that aim gets complicated. Over the long course of our history, the complications attending our way to genuine community correspond to great shifts or transitions which consciousness must successfully negotiate. In this blog I have been developing a theory of religion (from the Latin religare, to tie back) as the mediating system of stories, symbols, and sacraments (ritual practices) that facilitate our construction of meaning and keeps us oriented on the journey. My diagram identifies three relatively stable modes of consciousness and two transitional phases between them. The more stable stages represent periods when religion is confidently doing its job, while the phase transitions from one stage to the next are where things tend to go awry. In this post we will follow the path to its fulfillment, defining those stages and diagnosing the various deformations and pathologies that result when the move between them gets complicated. Communion and community sound like they should be synonyms, but in fact their distinct meanings are critical to understanding my model. We’ll get to community eventually, but let’s define communion as the preconscious state of oneness. Historically (for our species) and developmentally (for each of us as individuals) this mode of consciousness is prior to – and importantly continues to underlie and support – the awareness of ourselves as self-conscious centers of sentiment, personality, and will. The religion of this period is animism, and its job is to orient us inside the forces and rhythms of life. We’re not yet agents in life, managing an identity and making choices, but rather patients or ride-alongs on these mysterious currents moving through and all around us. We can try to remember back to early childhood and what life was like before language equipped our ability to divide and isolate this moving picture into countless pieces. Or we can let awareness drop, right now in this moment, below our center of self-conscious ego and into the sentient organism of the body – not “our” body, since a conceit of ownership is just one of the ego delusions. Even the possibility of dropping below the center of self-conscious identity presupposes an established center from which such a descent might be accomplished. This reminds us that the consideration of our topic of religion and human transformation will always take place from the particular vantage point afforded by our ego. From that vantage point the clarity of our perspective will be a function of how we got there, and what complications we suffered on the way. Theism is the religious paradigm dedicated to the construction of personal identity, tribal membership, and a coherent moral order. Its deity warrants this moral order, serving as the final arbiter of right and wrong, of who’s in and who’s out, as well as the exemplar of what devotees regard as proper character and ethical virtue. In a healthy and stable theism individuals are adequately centered in themselves while seeking to know and live according to god’s will. Following the commands of god ensures that members will get along, with each person playing his or her part in a role play directed from above. Arriving at a stable center of personal identity, however, requires that our transition of separating from others and becoming somebody goes smoothly. But it doesn’t always go smoothly. Separating out of that preconscious state of communion comes at a cost of some security, and to compensate for what we’re losing we attach ourselves to others with the expectation that they make us feel safe. The obvious problem with this compensatory strategy of attachment is that it prevents us from getting centered in ourselves. Without a stable center of our own, we can’t drop into the grounding mystery of our inner life, nor are we able to connect in healthy ways with others and devote ourselves to our mutual well-being. I have represented this neurotic condition in my diagram with a tightening spiral, locking us inside and away from our ground, from our proper center, and from those healthy connections which are the precondition for the rise of genuine community. I have written plenty of posts investigating the dangers of a theism organized around the insecure, grasping, and conceited ego. One place this plays out is in the representation of a god who is jealous, demanding, and vindictive; who wants all the praise and glory for himself. When religion gets hijacked this way, it becomes a serious impediment and threat to our human future. But in order that I can put the final touches on my model and theory of religion, we will assume that things have gone reasonably well, with each of us properly grounded and centered, oriented on the greater good and inspired to bring our best to the shared work of community. A healthy connection between two or more grounded and centered egos prepares us for the third and final stage of religion. What I’m calling genuine community is different from our original state of communion in the way it involves and depends on self-conscious persons joining together for a higher unity. For its sake, each person is invited to “go beyond” him- or herself for a transpersonal wholeness. With our motivation sufficiently liberated from insecurity and self-concern, we can together hold a vision for the well-being of all. Importantly, while some forms of spirituality after (“post-“) theism call for the negation of ego in pursuit of higher wholeness, the post-theism I advocate for acknowledges the necessity of having a stable center to launch from – and come back to. 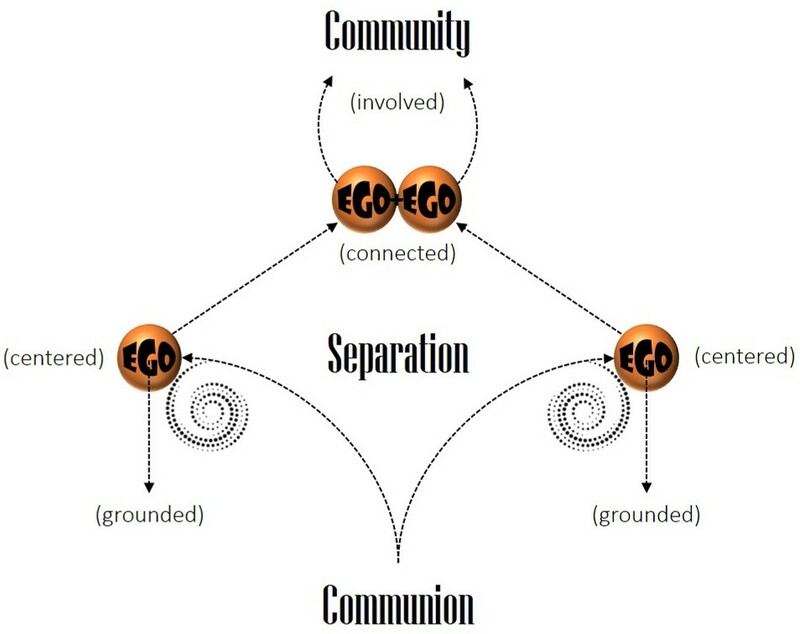 While it’s true that genuine community is a transpersonal experience of communal wholeness, to dissolve or subtract the ego rather than surpass and go beyond ourselves would effectively foreclose on its very possibility. From preconscious communion, through self-conscious separation, getting over ourselves and coming together in a spirit of unity: Each of us is on the way. Let’s keep going.